In 2003 the Muscle Beach Venice Bodybuilding Hall of Fame inducted its first “Hall of Famer” Don Howorth. Since that time over 40 notable individuals have been recognized and inducted into the Hall of Fame for their contributions. The pioneers of the original Muscle Beach in Santa Monica (Relna Brewer, Paula Bolsoems, Glenn Sundby, Zabo Kozewski etc.) laid the foundation for health and fitness at the beach. Their inspiration lead to the next generation of athletes that were acknowledged for accomplishments as notable bodybuilding greats, historians and photojournalists including Cory Everson, Lenda Murray, Rich Gaspari, Joe Gold, Steve Reeves, Dave Draper, Frank Zane, Bill Grant, Rachel McLish, Gene Mozee, John Balik and many others. In addition there were two Lifetime Achievement Awards presented to and honoring Joe Weider and Jack LaLanne for their world wide impact on health and fitness. Iron Man Magazine sponsors the awards for the Hall of Fame Inductees. 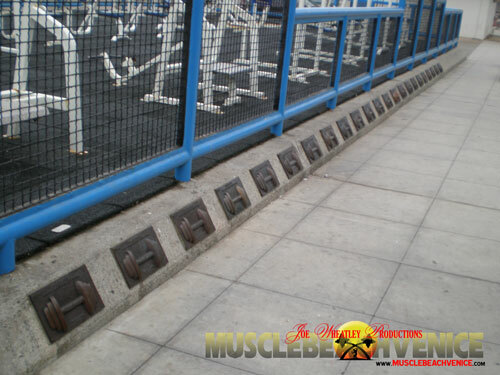 To gain a true appreciation and honor all the Inductees, Bodybuilding.com sponsored the Muscle Beach Venice Walk of Fame which opened in 2007. Bronze plaques, acknowledging all the inductees surrounds the world famous “Weight Pen” at Muscle Beach. Visitors from all over the world gain an understanding of all the contributors to the health and fitness industry. When visiting Venice California the home of Muscle Beach, please take a look at the Walk of Fame and find your favorite athlete.